What Should I Wear to the Job Interview? How you dress for a job interview is something that requires a good deal of consideration but is all too often overlooked. It is important not to fall into the trap of putting too little focus on what to wear. In fact, in job interviews there is a higher expectation for people to wear appropriate clothing. Most likely, it will be your best shot at convincing the recruiter or hiring manager that you’re the right one for the position. Obviously, the clothes you choose are not the only thing that matters when showing up for a job interview, but it is a vital part of making a good first impression. That impression could be the decisive factor that makes or breaks your chances of being hired. In most cases, recruiters and hiring managers have to choose from many candidates for a limited amount of available positions. Their job is to find ways to thin out the number of candidates until they find the most suitable one(s) to fill the position(s). If you are able to impress them from first moment you meet them, the likelihood of receiving a positive outcome increases greatly. On the other hand, showing up for a job interview dressed inappropriately can be enough reason to exclude you from being considered for the position. What are appropriate clothes and what are not? Companies are diverse and so are their level of formality. Unfortunately, there exists no single formulation for dressing perfectly for any and all job interviews. This means you have to find the balance yourself. For instance, you would hardly show up full suited to a job interview for a position in an industrial plant or casually dressed for a prestigious position at a bank. These are exaggerated examples but something to think about nonetheless. The general rule is that you should never “dress down” for a job interview, despite the company’s policy of dress code. If you are not sure how formal you should dress, the safe bet is to be more formal than not. One way is to roughly find out how formal the company culture is and try to dress up one level higher. Even if the company’s employees dress casually, you are not one of them. Not yet at least. When choosing your dress, keep in mind that often a simple and classic style is a safer bet than a complex, trendy or fashionable styles. Same goes for accessories like jewellery, makeup and perfume. It can easily distract the recruiter from the main purpose of the interview, which will most likely not end favourably for you. There are some standard dress codes out there that are easy to follow and are there for a good reason; they usually work well. Most importantly, it is about how you feel about yourself when wearing the clothes you choose. Confidence is the most important weapon you possess in order for you to be on your A game during job interviews. Confidence is all about self esteem, and how you feel about yourself is greatly determined what you wear. Being able to change clothes depending on occasion is precisely the power of dressing up: you get to choose which version of yourself you are going to be each time. Those who dress up and feel confident about themselves are much more likely to perform better in job interviews. To sum things up, you should focus on finding the outfit that you think is appropriate for the job interview you are attending. Be more formal than not, and above all, you should feel confident. 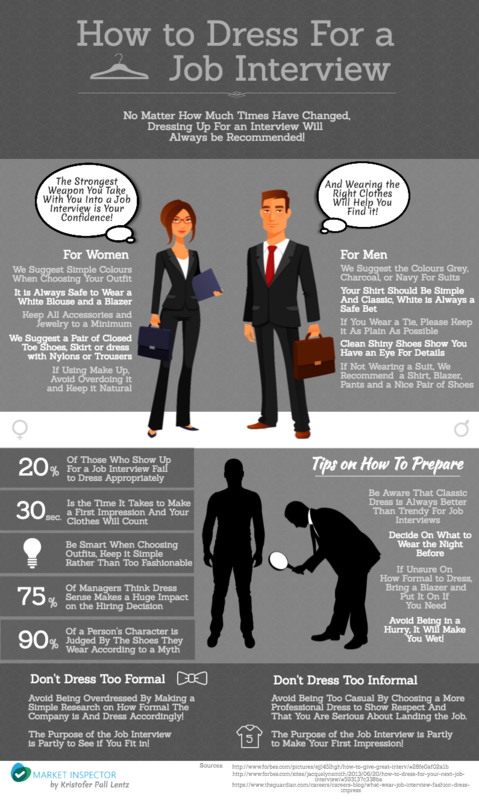 The following infographic by Market Inspector outlines some more useful suggestions and tips about how you dress for your next job interview. About the author: Kristofer Pall Lentz is a business marketing enthusiast, currently working for Market-Inspector.co.uk, a B2B marketplace for businesses and institutions in Europe. He is also taking his master’s degree in Strategic Market Creation at Copenhagen Business School.